Threepenny Opera at a cinema near you. Home / News / Default / Threepenny Opera at a cinema near you. Threepenny Opera, is a brilliant show being shown at a cinema near you. In addition how can we not share the news when one of our very own Agents for Change, Jamie Beddard (New Wolsey Theatre, Ipswich), is staring in the show?! So here is how it works and a link on how to find the cinema near you. National Theatre Live launched in June 2009 with a broadcast of the National Theatre production of Phèdre with Helen Mirren. 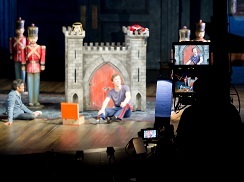 We’ve since broadcast more than fourty other productions live, from both the National Theatre and from other theatres in the UK.